As Democrats fight to take control of Congress from Republicans, an unusual issue is playing a decisive role in a key race that could determine control of the House: the federal workforce. 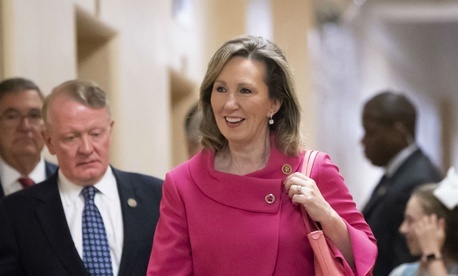 Virginia’s 10th congressional district, currently represented by Republican Barbara Comstock, is one of the most hotly contested races in the upcoming midterm elections. It is also home to tens of thousands of federal employees, whom both candidates are targeting for votes. Polls show a tight race, though forecasters like Cook Political Report give a slight edge to Comstock’s Democratic opponent, Jennifer Wexton. Comstock hopes her record since taking office in 2015 will help win support among her civil servant constituents. She signed a letter opposing President Trump’s executive orders limiting the powers of federal employee unions and making it easier for agencies to fire their workers, pushed for paid parental leave for feds and most recently, claimed to play a key role in securing a federal employee pay raise in 2019 over Trump’s objections (a claim Democrats dispute). The National Active and Retired Federal Employees Association gave Comstock an 88 percent score in the 115th Congress based on key votes over the last two years and a lifetime score of 75 percent, among the highest ranks for any Republican. She is now hoping that history will pay dividends at the voting booth next week. Comstock won the seat in 2014 following the retirement of fellow Republican Frank Wolf, who served in the seat for 34 years and was the most outspoken defender of federal employees in the Republican party over that span. To Comstock, her party affiliation is a key factor for why federal employees should support her reelection. Comstock noted that she has a relationship with Vice President Mike Pence, who was friendly with Wolf when the congresswoman served as his aide. She also served as a federal employee during a stint in the Justice Department. The campaign has been an expensive one, with the candidates and outside groups pouring more than $10 million into the race. Comstock has included information on federal employee issues in ads, campaign mailers and most of the speeches she delivers on the trail, and has a section dedicated to the subject on her campaign website. Jennifer Wexton’s site does not, and Comstock said her opponent is focusing too little on that segment of the constituent population. “I know my district much better than my opponent, who is not familiar with either federal employee issues or where and how federal employees are spread all around our district,” Comstock said. She called Wexton “AWOL” and “negligent” in recognizing feds as an issue in the campaign. Wexton has repeatedly tried to tie Comstock to the president, who is unpopular in the suburban district outside of Washington, pointing to the high percentage of votes the congresswoman cast in support of Trump’s agenda. Comstock noted that many of those votes were on funding bills to keep the government open. In a meeting at the White House earlier this year, Comstock challenged the president directly in telling him, “We don’t need a shutdown over this,” referring to immigration issues. Comstock said she has taken flak from members of her own party for advocating for federal employees and their pay, but ultimately is able to make them see her side. She called the Federal Employees Health Benefits Program “one of the best models of health plans” and vowed to work with the Trump administration on civil service reforms only when they stem from “grassroots, ground-up” ideas.